Backgammon Rules - How to Play Backgammon the right way! Below, is a comprehensive outline of the general rules of Backgammon. Whether a newcomer to the game, or an advanced player looking for a refresher, you should find the following information useful. Check out other portions of our Backgammon category for other materials regarding strategy, hints, probabilities, extras, etc. The wonderful game of Backgammon is played by 2 people facing each other at a table much like one would play chess. The movement of the players, or checkers, is governed by two dice thrown from a cup to ensure that everything is random. Both players have their very own pair of dice as well as their own cup for shaking the dice. A doubling cube with the numbers 2, 4, 8, 16, 32, and 64 on its faces is usually used in order to keep track of the stake of the game. Before beginning a game, either player may ask to roll for the choice of seats, checkers, or dice. The game's objective is to move all your checkers into your own home board and then bear them off completely. The first player to achieve this wins the game. 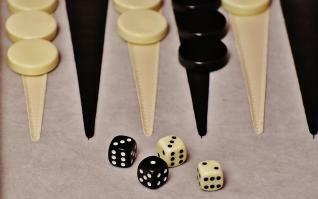 Backgammon games are relatively short in duration and, therefore, usually played in matches up to a predetermined number (i.e., the first player to win three games out of five is the winner of the match). Remember there are several variants of the game in which the setup is different so it's always important to know what you're playing - read more about the different Backgammon probabilities and strategies on our Backgammon Strategy page. At any point during the match, a player may ask to mix the dice. All four dice will be placed in the cup and rolled. The opposing player then selects one die, followed by the roller, then again by the opponent, and finally, the roller will take the last die. For the opening roll, each player rolls a single die. Whichever player rolls the highest number is the first to play, using the numbers that have come up. If the numbers are the same, each player must re-roll the die until there is a winner. After the opening roll, the players alternate rolling the dice and moving the checkers. When rolled, the dice must come to rest flat on the section of the board to the player's right. If either of the dice is not flat, they are said to be cocked and must be re-rolled. One of the most important Backgammon rules is that dice must come to a complete stop before they may even be touched by the player another of the most important Backgammon rules is that they may not be rolled until an opponent has completed his play. In both cases, the dice rolled must be rolled again if not in accordance with these backgammon rules. A play or turn is deemed complete when a player picks up his dice. If he does so without playing all legal numbers (i.e., he only utilizes one of the dice), the opposing player has the right to compel the player to use his remaining numbers or to overlook the error and continue play. A player who picks up his dice may not put them back on the board and resume his turn. Entering a checker from the bar which has been hit by an opponent (See Checker Movement Rule 3) the number of points shown on either die, to an open point in the opponent's home board. Bearing off of a checker in the player's home board, only once all of that player's checkers have been moved into this quadrant. Once all of a player's checkers are moved into that player's home board, he may begin removing them from the board, or bearing them off. The point of Backgammon is to end up with a clear board. When the player is finally in the position to bear off, a player may do so from a point corresponding to the number on a single die, or from the highest occupied point which is lower than the number indicated by the die. For example, a rolled 5 may be used to bear off a checker on the 4-point only if there are no other checkers occupying the 5-, or 6-point. If the number for an unoccupied point is thrown, no checker can be borne off if there are any checkers on a higher number. For example, if a player rolls a 3, he must move forward any checker that occupies the 4-, 5-, or 6-point, rather than bearing off one on the 1- or 2-points. You are not obliged to bear off a checker if you can move another checker forward from another, higher point. A single game is won when a player bears off all of his checkers before his opponent. If at the time of one player's victory, the opponent has not borne off any of his checkers, this doubles the initial wager and is called a Gammon. If at the time of one player's victory, the opponent has not borne off any checkers and has one or more checkers in the winner's home board or on the bar, this triples the initial wager and is called a Backgammon. In order to speed up play and intensify the element of risk and need for strategy, the doubling cube is often used. Backgammon is always played for a previously agreed stake per point and every single game starts with one point. If during the game one of the player's wants to, he proposes doubling the stakes. According to backgammon rules, this can only be done at the very start of his own before he has rolled the dice. Before rolling, if a player considers his position to be superior to that of his opponent's, he may offer to double the stakes of the game at hand. The doubling cube is placed so that it shows a 2, to indicate that the game has been doubled. The opponent now has the choice between accepting the offer of a double, and continuing at twice the previous stakes, or declining the doubling and forfeiting the current game at the original stakes. When a player accepts the offer of a double, he is now said to be in possession of the cube and reserves the right to re-double at any point before he rolls. Although the doubling cube has only the numbers 2, 4, 8, 16, 32, and 64 represented, the possibility to double is, in theory, limitless. Automatic doubles: We have spoken about doubling in the paragraph above but as the name suggests, automatic doubles are different in spirit. If identical numbers are thrown on the very first roll, stakes are doubles and the doubling cube will be turned to 2 and remain in the middle. Automatic doubling is usually limited to one per game. Beavers: When a player is doubled, he can redouble (beaver) straight away while continuing to possess the cube. The original doubler can either accept this or refuse it like he would with a normal double. The Jacoby Rule: Gammons and backgammons are considered to be a single game if neither player offers a double during the duration of the game. This rule speeds up the game by eliminating situations where a player avoids doubling so he is able to play for Gammon instead. 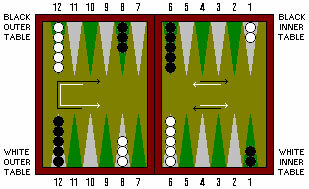 According to Backgammon rules, if an error appears in the setup of the board, it must be corrected if either player notices it before the second play of the game has been made. If a player makes an error in play regarding checker movement, either player may point it out and call for its correction only before a subsequent throw, and not after. Easy to play, Backgammon is really one of those games which will have you coming back for more. If you want an entire overview of this fascinating game, visit our Online Backgammon page and get your cup ready to shake For more games, visit our Online Casinos USA page. Check out our full casino games guides to find out all about rules and strategy. Then start playing at an online casino!